I was nominated by @snowpea to provide my favorite bible verse. It has taken me some time, because I wanted to also take the opportunity to put it to art. This excellent challenge was originated by @csalupado . I would like to nominate @bluerthangreen to keep this lifeverse content flowing! Thank you for the inspiration to keep posting encouraging content. I think we all at some point in our life have received comforting words such as “don’t worry, it will all work out.” To me, it is kindly meant, but really who can say or receive such things with assurance? When my Dad suffered and eventually died of brain cancer, words like that couldn’t bring peace to those close to the situation. So, when I consider the meaning of this verse in my username, I am not speaking of all things working out peachy. What can we say though? “He who did not spare His own Son but gave Him up for us all, how will He not also, along with Him, freely give us all things?" How can I question my Lord, in what he allows when I believe that he sent His one and only Son to suffer and die for my sins? How can I question His goodness? He works on my behalf. He is good. And he holds my future in His hands. 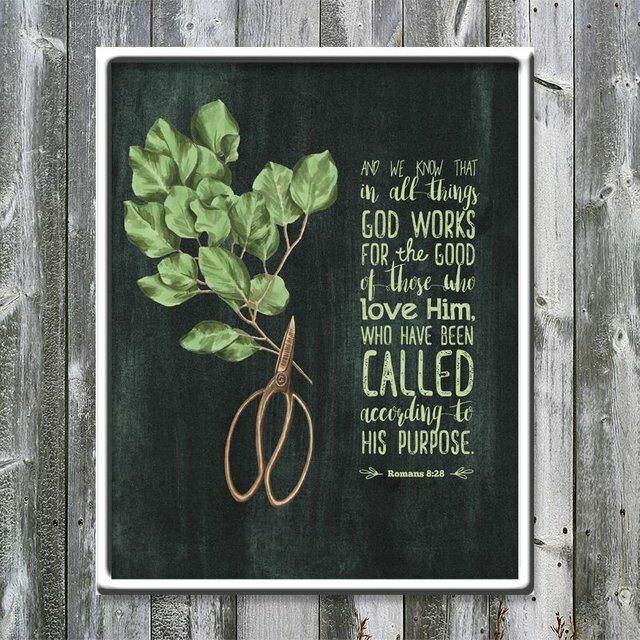 When I think about God allowing challenges and trials in my life, I think about how He is the Master Gardener, carefully pruning my character. Those who have fruit trees know the importance of pruning to enable future fruitfulness. That is the point behind the visual of branches and scissors. The grey chalkboard color provides a gentle backdrop that works well with the graphics and text. 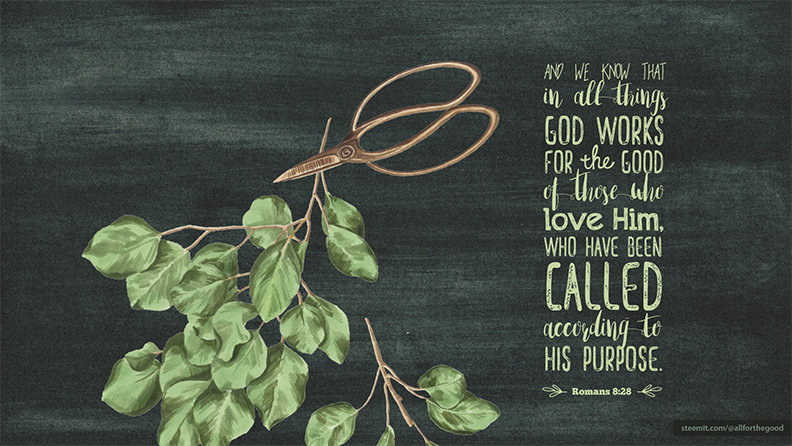 A simple design for a profound verse. Well said! I have recently thought about character-building situations and, in my mind, boiled it down to a question: Would I trade my problems for never having met my Saviour? The answer to that is so simple - no way! The apostle Paul had it right when he said in Romans 8:18 "For I reckon that the sufferings of this present time are not worthy to be compared with the glory that shall be revealed in us." KJV. Well said! Perspective makes all the difference. Congratulations! This post has been upvoted from the communal account, @minnowsupport, by allforthegood from the Minnow Support Project. It's a witness project run by aggroed, ausbitbank, teamsteem, theprophet0, someguy123, neoxian, followbtcnews, and netuoso. The goal is to help Steemit grow by supporting Minnows. Please find us at the Peace, Abundance, and Liberty Network (PALnet) Discord Channel. It's a completely public and open space to all members of the Steemit community who voluntarily choose to be there. 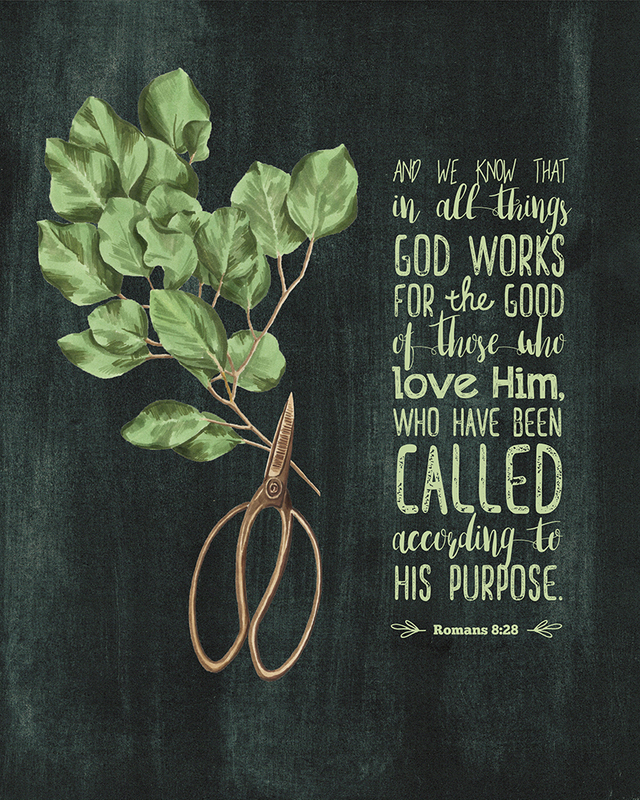 I remember learning Romans 8:28 as a kid in AWANA and Word Of Life clubs. It is one of my favorite Bible versus. Thanks for sharing, hehe. You are awesome. I'm Oatmeal Joey Arnold. You can call me Joey.